Spain, home of the perfect goal! Football as a work of art is rarely showcased better than when Spain take to the field and Julen Lopetegui’s men displayed this once again with a stunning team goal past Albania on Friday night. Across 51 seconds, La Roja passed the ball 17 times through 10 players as only Jordi Alba failed to have a touch in the move that made it 2-0, and helped guarantee the team’s qualification to the World Cup. And Spain have been creating these masterpieces for some time, with Sergio Ramos capping off a delightful move in October 2007 away to Denmark. That attack was witnessed over 75 seconds through nine players, touching the ball 65 times and completing 28 passes. It also made the score 2-0 in a crucial qualifier as La Roja booked their place at Euro 2008, a tournament they would win. At the main event in 2016, Alvaro Morata finished off a smart piece of tiki-taka football in the group stage of the European Championship against Turkey. 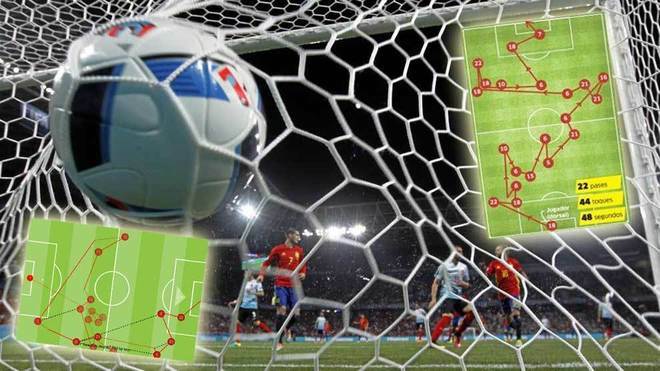 Making it 3-0, nine Spain players were involved in 22 passes over 48 seconds. Topping the charts in terms of the sheer length of the build-up play, David Silva’s goal against Scotland in 2011 involved 42 passes as every player on the team had a hand in the strike. After a long keep-ball session, Spain moved it to the left flank for Alba to whip in for the Manchester City midfielder. Xavi was the most involved in creating the goal, touching the ball eight times as the Scots conceded after one minute and 34 seconds of defending, marking out just how good La Roja are at patiently dreaming up the perfect goal.